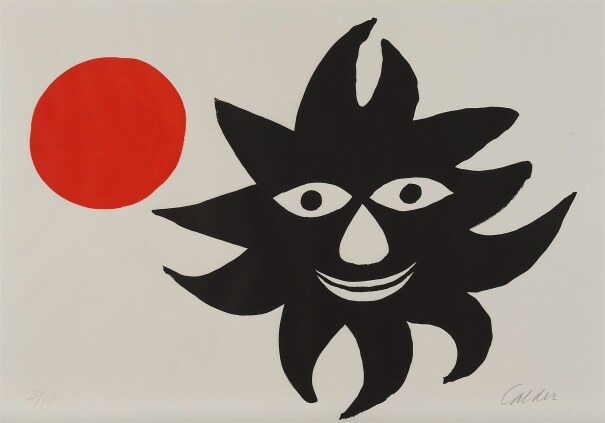 Alexander Calder worked as an abstract sculptor and has been commonly referred to as the creator of the mobile. He employed industrious materials of wire and metal and transformed them into delicate geometric shapes that respond to the wind or float in air. Although born into a family of sculptors, the artist studied mechanical engineering before pursuing a career in art; these studies may explain the science behind the unique balancing act of his dynamic structures. In addition to his mobiles, Calder produced an array of public constructions worldwide as well as drawings and paintings that feature the same brand of abstraction. Calder lived in Lawnton, Pennsylvania. Lithograph in colors, on Rives BFK paper, with full margins. Signed and numbered 30/100 in pencil, framed.